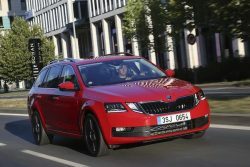 The 2019 Škoda Octavia G-TEC, presented at IAA 2018, comes with a new, more powerful 1.5-litre bi-fuel TSI engine (96 kW / 130 PS) and improved CNG range. Running on Compressed Natural Gas (CNG) reduces CO2 emissions by around 25 percent compared to petrol. In addition, significantly less nitrogen oxide (NOx) is emitted and there are no soot particles. The Octavia G-TEC is exclusively available as a COMBI and in the Active, Ambition and Style trim levels. Compared to the predecessor model, the power output of the new G-TEC has increased by a substantial 15 kW (20 PS), to 96 kW (130 PS). The vehicle complies with the currently strictest EU6d-TEMP emissions standard and achieves a range of 480 km when travelling purely on environmentally friendly natural gas. Its three CNG tanks have a combined total capacity of 17.7 kg. An 11.8-litre petrol tank ensures mobility in regions with no natural gas fuelling stations.